The European Scout Region is the divisional office of the World Scout Bureau of the World Organization of the Scout Movement, headquartered in Geneva, Switzerland, with two regional offices, in Brussels, Belgium, which focuses more on external relations and partnerships; and in Belgrade, Serbia, to support the national Scout associations in Southeast Europe. 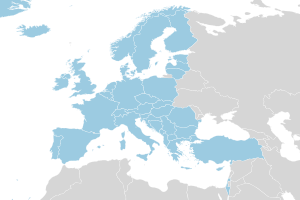 The European Scout Region comprises 40 National Scout Organizations that are members of the World Organization of the Scout Movement, and services Scouting in Western and Central Europe, excluding the former Soviet Republics of Armenia, Azerbaijan, Belarus, Georgia, Moldova, Russia, and Ukraine, but inclusive of Cyprus (technically not part of Europe) and Turkey (which spans across two continents), for cultural reasons, and Israel for political ones. All the formerly Communist states of Central and Eastern Europe and the Soviet Union have developed or are developing Scouting in the wake of the renaissance in the region. These include Albania, Bulgaria, East Germany, Hungary, Poland, Romania, and the successor states to Czechoslovakia, Yugoslavia and the Baltic nations independent of the former Soviet Union. Of these, Poland, the Czech Republic and Hungary have been most successful in regrowing their Scout movements and are very well-developed, thanks in part to the existence of Scouts-in-Exile movements for the diaspora of each nation. Nordic Activity Badge issued by the Nordisk Samarbeidskomité. The Scout and Guide associations of the Czech Republic, Hungary, Poland and Slovakia cooperate in the organization of the Central European Jamborees. The needs of Scout youth in unusual situations has created some interesting permutations, answerable directly to the World Scout Bureau. For years there was an active Boy Scouts of the United Nations in Geneva, as well as 84 Scouts of the European Coal and Steel Community, an early precursor to the European Union. This region is the counterpart of the Europe Region of the World Association of Girl Guides and Girl Scouts (WAGGGS). The European Scout Region has strong connections to the Europe Region of WAGGGS. Both maintained a joint office in Brussels for some years and published a monthly newsletter called Eurofax (this newsletter was already published by the European Scout Office before the joint office was opened, and reverted to WOSM when the joint office closed; it is still in existence under the name Euro.Scout.Info). A WOSM joint Eurasian-and-European Scout meeting was held in Kiev in April 2009. The European Scout Jamboree 2005 (EuroJam 2005) was held in the summer 2005 and lasted for 12 days between July 29 and August 10, in Hylands Park, Chelmsford, Essex, near Gilwell Park, an important campsite and training center for Scout Leaders. About 10,000 Scouts from 40 countries were involved; it was considered the biggest Scout gathering in Europe for over 10 years and 50 years in the United Kingdom. It was also a dry run allowing the organization team of the 21st World Scout Jamboree to test a number of aspects of the upcoming event, e.g. traffic issues, necessary infrastructures and logistics. Roverway is a joint activity of the European Region of WOSM and the Europe Region of WAGGGS. It is open for youth aged 16 to 22 years. The activity was introduced in 2003 and consists usually of two stages: a "journey" with small units of Scouts making their way to the main camp, which is the second stage. Roverway 2003 in Leiria, Portugal; motto "People in motion"
Roverway 2006 in Florence, Italy; motto: "Dare to share"
Roverway 2009 in Úlfljótsvatn Scout Center, Iceland; motto: "Open up"
Andorra is one of only five of the world's independent countries that do not have Scouting. The population is sufficiently large to sustain Scouting, but the Scout association of the tiny enclave in the Pyrenees has been dormant since the 1980s and at present there is no Scouting movement. As far as is known, there has never been a Scouting organization in Vatican City. Two other multinational Europe-specific Scout organizations exist, not linked to WOSM, the only geographic area to have such. These are the Confédération Européenne de Scoutisme and the Union Internationale des Guides et Scouts d'Europe. This page was last edited on 17 January 2010, at 16:46.